If you haven’t seen the original film, this new version starring Esme Creed-Miles is a perfectly fine adventure tale. “Hanna” is the story of a teen assassin, raised in Finland by an ex-CIA father. Hailed as a different type of action movie, and helmed by auteur director Joe Wright, the drama jump started the A-list career of Saoirse Ronan, who has gone on to multiple Oscar nominations and become the type of actress who in her early 20s can pick projects at will. 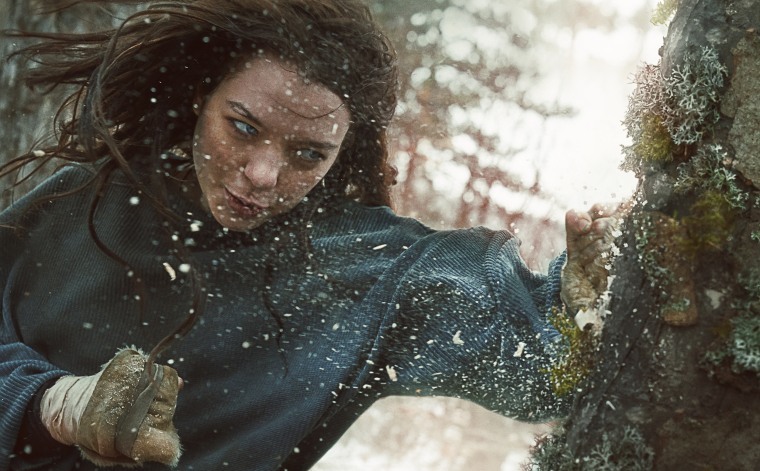 Except, that’s the 2011 movie version of “Hanna.” This is a review of the 2019 TV version of “Hanna,” a new Amazon series that takes the plot of the original film, which was a nuanced deconstructionist interpretation of the action genre, and turns it back into a far more simplistic narrative that it probably was always meant to be. This is not to say the new “Hanna” is exactly bad. If you haven’t seen the original film, it’s a perfectly fine action-adventure tale. This is not to say the new “Hanna” is exactly bad. If you haven’t seen the original film, it’s a perfectly fine action-adventure tale; “Harriet The Spy” turned up to 11 and then some. (Assuming, of course, that “Harriet The Spy” was a ruthless killer on par with “La Femme Nikita.”) The titular role this time is played by Esme Creed-Miles. And while it may be a little too soon to say this show could launch Creed-Miles’ career in the same way that it did Saoirse Ronan’s, she’s clearly an actress to watch. Her father Erik is played by Swedish star Joel Kinnaman. His is a serviceable and solid performance, as he turns Hanna into a lethal killing machine with one target in mind: Marissa Wiegler (Mireille Enos), the woman responsible for killing his wife and Hanna’s mother. Enos, who gained acclaim for her portrayal of a complex detective in “The Killing,” attempts to remake her character with compassion, perhaps aware she cannot pull off the same level of inhumane ruthlessness Cate Blanchett originally created. Remaking an artsy auteur film also seems like a win-win situation when one considers how much prestige TV has been leaning into the idea of television as a way of telling a more extended version of a single story. Multiple series have claimed that theirs is really an eight, or ten or even 13-hour movie, rather than a show. The problem is, transforming a movie from two hours into eight means that something must be added somewhere. “Hanna” is stubbornly unwilling to do facilitate this narrative expansion. Especially in the early episodes, the TV show and movie match practically point for point. The one key difference? All of the film's fantasy elements have been removed. Remaking an artsy auteur film also seems like a win-win situation when one considers how much prestige TV has been leaning into the idea of television as a way of telling a more extended version of a single story. It takes nearly three hours for the series to begin to really deviate from Wright’s material. When it does, it doesn’t go off in a new direction, instead choosing to indulge in a far more conventional series of tropes. Some of these changes are welcome. For example, the production spends far more time exploring the consequences of what happens when a child raised away from the real world is suddenly dumped into the 21st century. There’s alsomore time given to Hanna’s friendship with Sophie (Rhianne Barreto), and Hanna’s interactions with Sophie’s more normal British family. These scenes give the story a more realistic and grounded place to work from, painting the picture of a teenager attempting to become heroically well-adjusted despite being raised to become a deadly assassin with espionage skills that would put James Bond to shame. However, in grounding the story in this realism, the series dumps all the fairy tale aspects that made the movie “Hanna” so strange and wonderful. The original tale was told through the eyes of a young girl’s overactive imagination, blending insane, all-consuming training with bedtime stories. Eventually, it becomes nearly impossible to divorce what is fantasy and what is real in Hanna’s head. In the show, all the references, both direct and indirect, to “Red Riding Hood,” “Hansel and Gretel” and other Eastern European traditional folklore are dropped. The quarries Hanna stalks are no longer big bad wolves, there are no wicked witches; instead, we have a coming-of-age story overlaid on a straightforward spy-vs-spy battle. Those who loved the original “Hanna” will most likely be disappointed. Those looking to turn this into a story that can last 16 or 24 episodes will see the potential. But one can’t help but wonder why this had to be a mutually exclusive endeavor. Amazon clearly believes in the project. The service has been pushing the series hard, releasing the opening episode for 24 hours post-Super Bowl in February, and then airing the next two at the Berlin Film Festival a couple of weeks later. This slow roll-out strategy was clearly designed to create buzz ahead of this weekend’s drop of all eight episodes. Whether it will be enough for get audiences to watch remains to be seen. But Amazon Prime users who appreciate this teenage girl spy story may also want to check out the original “Hanna,” too.